On 24 February 2015, a meeting was held with the Steering Committee of the Council of Europe Action Plan for Georgia 2013-2015. Representatives of respective Georgian agencies, non-governmental organisations and institutions directly involved in the implementation of projects under the Action Plan took part in the meeting. 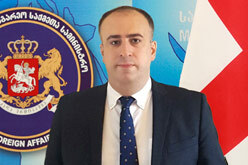 The Georgian Deputy Minister, Gigi Gigiadze addressed the participants of the meeting. The Council of Europe Action Plan for Georgia 2013-2015 was adopted by the Council of Europe Committee of Ministers as a result of consultations held between the Georgian authorities and the Council of Europe in October 2013. On 6 February 2014, an official presentation of the Council of Europe Action Plan for Georgia 2013-2015 was held as part of the visit of the Council of Europe Secretary General Thorbjørn Jagland to Georgia. The Document comprises projects to be carried out in Georgia by the Council of Europe during the years 2013-2015, and aims to cooperate with the Georgian Government in the implementation of the Organization’s key principles: human rights, democracy and the rule of law. The projects under the Action Plan deal with the following areas: human rights protection; independence of the judiciary; penitentiary and police reforms; freedom of media, expression and assembly; free and fair elections; good governance; local democracy; tolerance and anti-discrimination policy; confidence building mechanisms. During the meeting, the representatives of the CoE and respective Georgian agencies discussed the already implemented or planned projects, as well as issues relating to making amendments to the Action Plan and to attracting donors. The Council of Europe carries out the projects under the Action Plan in coordination with the European Union.